An intimate address on the Upper East Side - The Surrey began as a townhouse to the stars of the 1920s and is now a hot 2014 pied-a-terre. 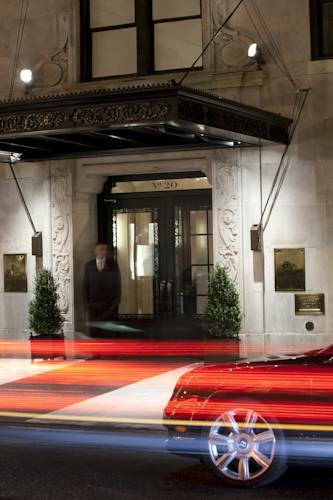 Its location on Madison Avenue - just a block from Central Park - gives cultured guests direct access to world-class museums and iconic landmarks - while its discreet service allows for calm personal space. The Surrey offers world-class dining by Cafe Boulud and the atmospheric Bar Pleiades - as well as Cornelia Spa and a Private Roof and Herb Garden featuring seasonal cocktails. The art-inspired aesthetic and Michelin-starred dining creates a sense of true exclusivity-ideal for intimate meetings or social receptions on the Upper East Side. An impressive collection of 31 original modern artworks are dispersed throughout the private and public spaces. The 189 contemporary salons and suites were created by Lauren Rottet - accommodating style-icons and art aficionados the world over. The Surrey offers a prestigious Upper East Side location - within easy walking distance of New Yorks best museums - landmarks and shopping. Central Park is one block from the Hotels doorstep. The Surrey is located on East 76th at Madison Avenue. All of the citys best attractions - theaters - businesses and shopping addresses are within easy reach of the Hotel. Chef Daniel Bouluds twist on French cuisine prepares with American ingredients inspired by four Muses - Seasonal - Traditional - Vegetarian - World Vegetarian and World. This Michelin-starred restaurants menu changes seasonally. Inspired by 1930s Bar Cart and a Chanel Bag - this Art Deco club offers an ambiance reminiscent of a classic era. Classic cocktails and unique drinks are offered from chef Daniel Boulud along with a light menu. Our modern suite features stunning views of Central Park and the Upper East Side. The suite includes a living room - dining room - fireplace and full kitchen. The suite showcases a formal dining room - full kitchen facilities - wet bar and generous sized living room for socializing. A spacious seating area is set around the grand marble fireplace.